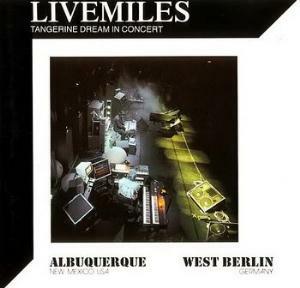 "Livemiles" is composed of two nearly 30 minutes long pieces (supposedly) captured live in 1986-1987. In the tradition of their previous concerts, the music features mostly previously unreleased material. The style is similar to "Underwater Sunlight", however with more electronics and less guitars. Despite artificial and very dated sonorities - due to the increasing usage of MIDI - the inspiration is present. As always with TD's live releases, a doubt remains whether tracks have been played live, rearranged or created in studio. For this review, I will only focus on the music, not the process. "Part 1" is presented as a live performance in Albuquerque from June 1986, however fan recordings contradict this affirmation. According to other people, it could have been taken from a Cleveland concert two weeks later, but in a different version. Is it a studio composition? We'll surely never know. Anyway, this part is the best and the most dynamic of the two. It displays various soundscapes, changing rythms, enigmatic and energic atmospheres. Froese's guitar can be heard in the last part, and the finale is dreamy. To sum up, this composition is what you expected of TD for their studio works from the same period, in terms of quality and sounds. 3.5 stars. "Part 2" is an extract from the August 1st 1987 West-Berlin concert, the last one with Christopher Franke. This time the provenance is confirmed, but this track is more unequal than Part 1. The first third is a bit cheesy and the least interesting passage of the record. The second third is more mysterious and features a nice pulsating sequence. The last third is relaxing and includes a reprise of "Dolphin Dance", however in a different version than the original. 2.5 stars. Let's make it simple: if you enjoy "Underwater Sunlight", you may appreciate "Livemiles", if not, well, this record is not for you. "Livemiles" can be regarded as the 1986 studio album's electronic companion, it somehow extends the submarine adventure. Despite lengthy passages and 80's sonorities, the music does not sound too new age and is quite pleasant. "Livemiles" comes as an unexpected good surprise for the late eighties. Its interest and homogenity is higher than the band's studio albums of the same period. For these reasons, this disc deserves a listen.